During his state trip to South Korea, President Trump claimed "hundreds more" might have died if another man had not been able to "neutralize" the alleged shooter with a gun of his own during the Nov. 5 Texas shooting. While visiting South Korea on Tuesday, President Trump was asked whether he supports increased vetting of gun purchasers, given the mass shooting that occurred on Sunday in Texas. One part of his response would not surprise close observers of his presidency. This refrain is a common one. Chicago has tried to crack down on guns, but has seen a surge in gun violence. The implication from Trump’s comments, then, is that new gun regulations wouldn’t prevent gun violence — and might even make it worse. But as a report released earlier this year by the office of Mayor Rahm Emanuel (D) reveals, most of the guns recovered in Chicago came from outside the state. Only 40 percent of the guns recovered in the city were purchased in Illinois, the report read, including hundreds purchased at gun shops outside city boundaries. 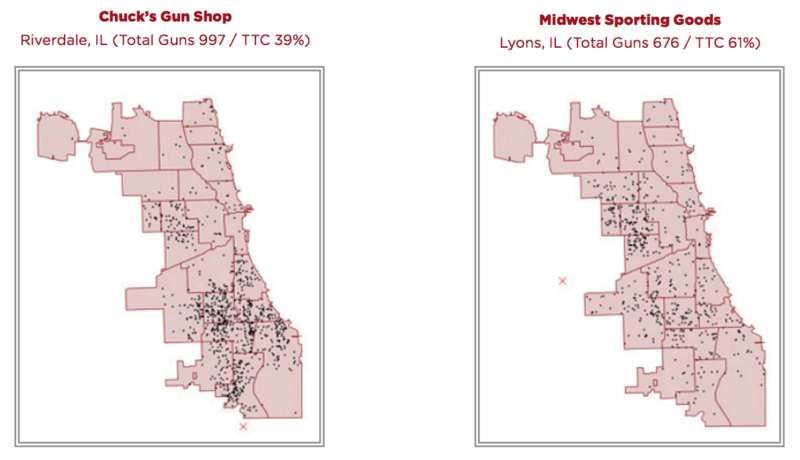 The report includes maps of two gun shops from which a large number of guns recovered in Chicago were purchased. The black dots are where the guns were recovered; the red Xs are the locations of the gun stores. 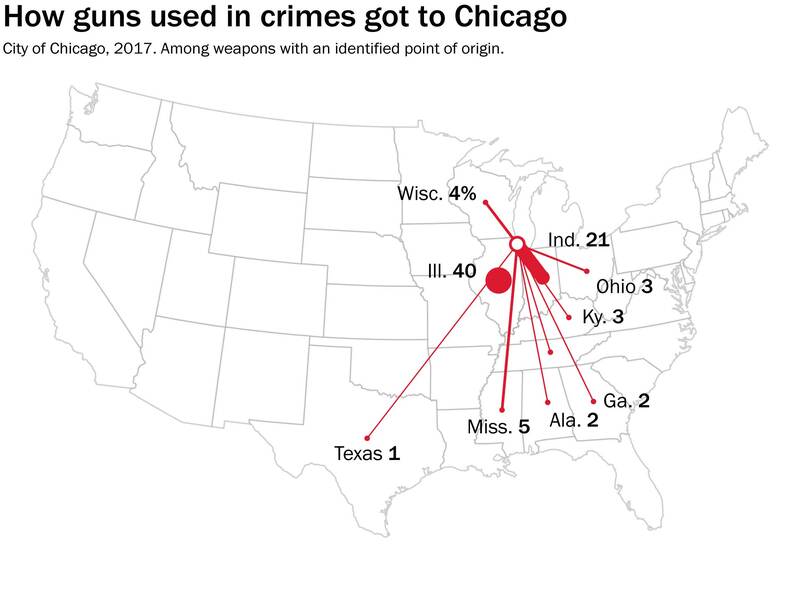 Many of the guns recovered in Chicago — a fifth of them — were purchased in Indiana, which abuts the city’s eastern border. An additional 9 percent of the guns recovered in the city came from Mississippi and Wisconsin. This pattern is not unique to Chicago. States with tougher gun laws often discover that places with more lax legislation are the source of many of the firearms used in crimes. Last year, the attorney general of New York issued a report about the flow of guns into his state. Attorney General Eric Schneiderman identified what he called the “iron pipeline,” a string of East Coast states through which guns flowed into the state. 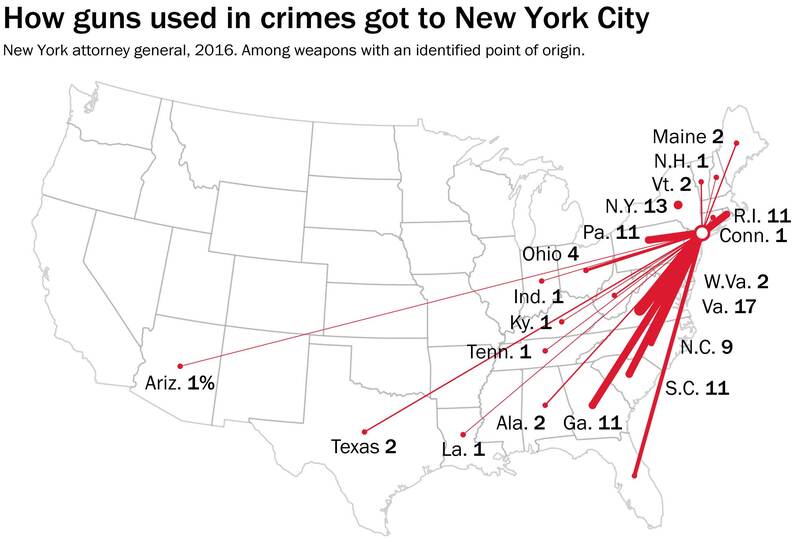 In New York City, for example, nearly 9 in 10 firearms come from out of state. Unlike Chicago, the city doesn’t abut a state with looser gun laws. To its west is New Jersey; to the east, Long Island and Connecticut. The Bureau of Alcohol, Tobacco, Firearms and Explosives compiles statewide data on recovered firearms. The most recent data, covering 2016, reveals some interesting patterns. A blue block indicates that the state identified at the left side of the graph is a major source of firearms for the state labeled in each vertical column. The darker the blue, the more guns came from that state. 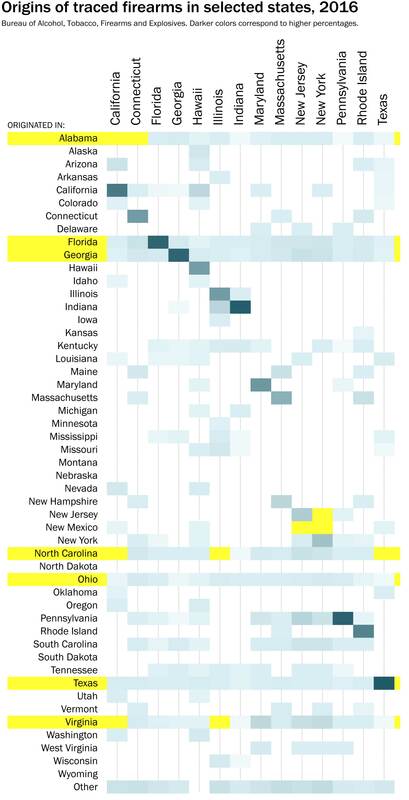 Notice the states highlighted in yellow. Several states — Alabama, Florida, Georgia, North Carolina, Ohio, Texas and Virginia — are common sources of firearms for most of the states for which we compiled data. Those states are also ones in which gun laws are not among the most stringent. Also notice the yellow block at the center right of the graph. In New York and New Jersey, the blocks marking guns bought in each of those states are fairly light, compared with the block representing the number of guns from Indiana recovered in Indiana. In other words, a lower percentage of the guns recovered in New York and New Jersey were purchased in New York and New Jersey — meaning that more of the recovered firearms came from out of state. Chicago still has an undeniable problem with gun crime, and many of the guns used in those crimes come from dealers in the state. But blaming Chicago’s gun violence on its gun laws misunderstands the economics at play nationally. Inadvertently, Trump is undercutting his own point. To reduce the number of guns used in crime in Chicago, one can argue, you’d need to implement tougher gun laws nationally to cut down on the number brought into the city. That, of course, was not the goal of Trump’s argument. Philip Bump is a correspondent for The Washington Post based in New York. Before joining The Post in 2014, he led politics coverage for the Atlantic Wire.